Our household is in transition. Most of September has been spent dealing with real estate issues; a business as complex as the tips of a Spey line. Free time – fishing time – time fishing simply with one fly on a slip-knotted level line – has been swallowed up in the sudden way a largemouth bass inhales a popper floating on the surface of a pond. 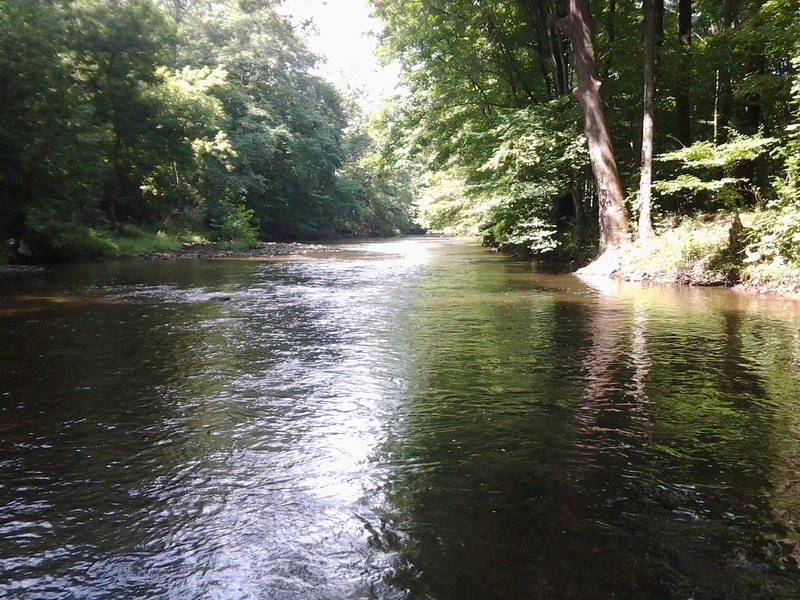 My fishing, then, at least during this September, consisted of a few hours on the day after Labor Day; a sunny morning along a shaded length of French Creek in Pennsylvania’s Chester County. The scene was pretty: late summer wildflowers like orange jewelweed in bloom; mushrooms glowing white amongst the leaf litter. A frog plopped into the water in front of me and swam to a little point of stone projecting out of the current. Wet wading was easy for me, too, as I found that flow ran summertime low, but this hampered my recent desire to experiment with the large nymph. My attempts were foiled by a steady stream of hang ups along the rocky bottom. I did catch sight of a few rises across a slow bend downstream. A size 16 BWO was sent across to explore the spot. 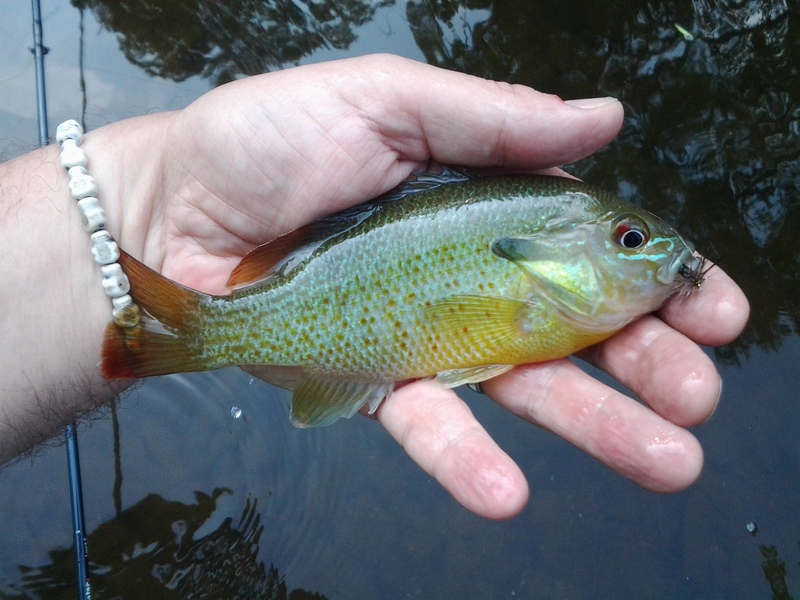 Two redbreast sunfish quickly came to hand. 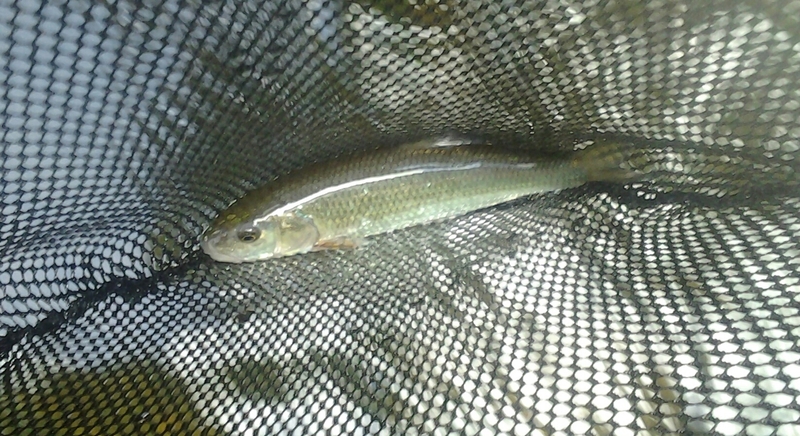 A fish on the line and in the net made the day a success. Time was progressing in earnest; I therefore kept moving to see what experience I could squeeze into the remaining hour or so at my disposal. This compelled me to hike upstream to a stretch I had not fished for two years. Here there are several deep runs interrupted by an exposed outcrop of cobblestones: wrinkled water ideally suited to fishing emergers and soft-hackles. The white-tailed deer seem to like the soft moss around this spot as well. I flushed a buck and two doe as I approached the carpeted bank. Each deer took its turn to bound across the creek and into the trees. I followed them as far as the water. Another frog’s antics entertained me as I knotted on a small Black X-Caddis emerger. This little fly has worked well for me when sent swimming across and downstream in low flows. One brassy flash I missed on the first cast was certainly the day’s brown trout. A pause followed; one necessary to recapture my rattled peace of mind. Once obtained, the target zone shifted to a deeply shaded seam that ran down the center of the creek. The pattern swung into a strong strike, like a bat meeting a baseball, quickly followed by an athletic jump that lit up the scene. The taker then surged straight toward my legs. The net once again came to my rescue as I maneuvered it into position to handle a large and very bright fallfish. My cell phone chirped a few moments later. My wife had sounded the call to come back to the in-laws so we could have lunch before boarding the train back to Manhattan. I was happy to have had this time on the water, however brief, given how belabored by the business of life we have become. 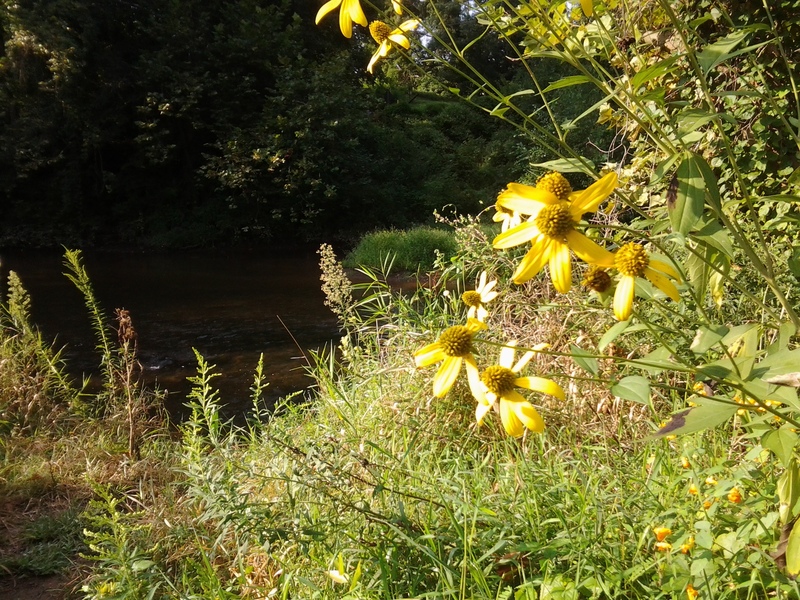 Having lived in nearby Limerick, PA for quite some time, I’ve been fortunate to fish French Creek myself a few times. Pictures like that make me miss some nice little suburban gems like French, Valley Creek, & Pickering Creek. Glad you were able to enjoy it as well. Did you happen to stop in French Creek Outfitters while in the area? A nice little outdoors store with a fair fly fishing assortment. Thanks, troutrageous1. Yes, I do visit French Creek Outfitters several times each year; I purchase my PA license and trout stamp there every Easter weekend, in fact.